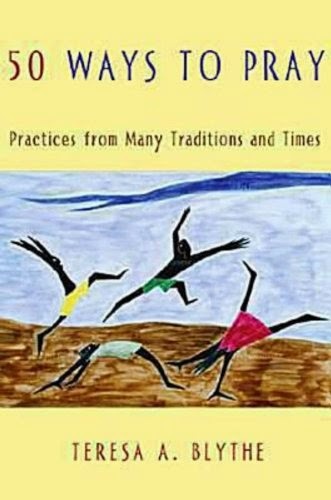 I've been using 50 Ways to Pray: Practices from Many Traditions and Times by Teresa A. Blythe to help structure my devotional time in the morning. After reading Seeing is Believing, by Greg Boyd, I was intrigued by the concept of imaginative prayer and other prayer traditions outside my range of familiarity. The book is arranged into chapters focusing on various types of prayer, including biblical reflections, contemplative practices, lectio divinas, life reflections, discernment processes, body prayers, prayers of the imagination, reflections on media and praying for others. Each exercise begins with a short paragraph of background into the practice's origins. Blythe gives the intention for the exercise, a step-by-step description of the exercise and a tip for overcoming common difficulties or distractions. I've only made it through the first two chapters so far. I don't normally post about books I haven't finished yet, but since I don't use the book every day, I'm working through it at a prayerful snail's pace. So far, this book has led me to hold an imaginary conversation with the midwives in Exodus 1, create my own psalm, craft my own personal prayer of the heart, and to get comfortable with silence. I'm still looking forward the exercises on imaginative prayer, reflecting on life, prayer walking and art as prayer. Several of the exercises in this book are meant to be done with a partner or in community, so I've had to skip over them, in hopes that I'll find someone to join me in these prayer experiments. Additionally, I read carefully, but skipped over a few of the prayer exercises, such as praying with beads or icons. I felt Blythe made a good case for why using tools while praying did not necessarily confer idol status onto them, but the thought of "not making a graven image" was too distracting for me to complete these exercises fruitfully. Overall, I'm really grateful to have this book. It packs in so many ideas and suggestions for expanding and deepening my understanding and experience of prayer.